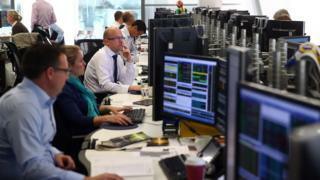 The FTSE 100 has risen to an 11-month high, spurred by speculation of an interest rate cut on Thursday. The FTSE 100 index closed 1.4%, or 92.2 points, higher at 6,682.8. Bank of England governor Mark Carney hinted recently that fresh stimulus measures could be needed following the Brexit vote. Joshua Mahony, an analyst at IG, said markets thought there was a 75% chance of the key interest rate being reduced from 0.5% to 0.25% this week. The FTSE 100 has now risen by more than 20% since 11 February when fears about the Chinese economy spooked investors, putting the index back in bull market territory. Laith Khalaf, senior analyst at Hargreaves Lansdown, said: "Overall the Footsie has definitely proved resilient in the face of all the uncertainty created by the Brexit vote, though that really is testament to the international make-up of the index, and the long-standing faith in central bankers to come to the rescue by turning on the printing presses. "With interest rates looking like they are on the way down and potentially some more Quantitative Easing on the way, stocks are likely to remain well-supported, if volatile." The more UK-focused FTSE 250 soared 3.3%. or 528.6 points, at 16,708.3. Property shares led the FTSE higher as their recent recovery continued, with Taylor Wimpey up 7%, Persimmon 7.1% higher and Barratt Developments rising 7.7%. Shares in property-related companies have suffered big falls since the UK voted to leave the EU, although a partial recovery was sparked last week after a note from UBS suggested the sell-off had been overdone. Burberry rose 4.3% after the fashion company said that Christopher Bailey would be replaced as chief executive by Celine boss Marco Gobbetti. Meanwhile, sterling rose after Andrea Leadsom quit the Conservative Party leadership contest, leaving Home Secretary Theresa May unopposed in the race to succeed Prime Minister David Cameron. Against the dollar, the pound had fallen below $1.29 earlier, but then rebounded as reports circulated that Mrs Leadsom was to leave the contest. In late trading the pound was up 0.3% against the dollar at $1.2988. Against the euro, sterling was 0.4% higher at €1.1768. John Hardy, head of currency strategy at Saxo Bank, said: "There is a bit more political clarity which is giving sterling a bit of a boost." However, he added: "We should see a fair bit of resistance around the $1.30 area." The pound still remains well below levels reached before the EU referendum, when it had been trading at about $1.50.